Making Time for Tea, High Tea. Home » Making Time for Tea, High Tea. I’m always on the look out for fun things to do in Cape Town – and High Tea is predictably quite high up on my list of things that I enjoy. What’s not to like, there’s unlimited amounts of tea, different snacks and treats to sample, all while you relax in a comfortable couch with plenty of opportunity for people watching. 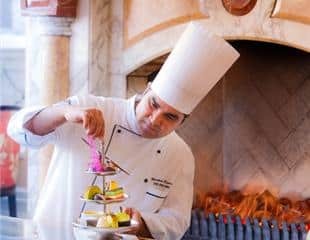 One of Cape Town’s best places to go for High Tea is the Table Bay Hotel. Held in the Lounge, the High Tea is priced at R185 pp, the season menu caters for all tastes drawing inspiration from South Africa’s cultural diversity. There is almost too much to choose from, with an array of sweet and savoury options. The waitrons are friendly and knowledgable and will even help you pair your tea with the treats you have selecyed. The Lounge at the Table Bay Hotel has a view overlooking the harbour and Table Mountain – it’s peaceful, chic and the attention to detail makes High Tea a treat. If you’ve got a special occasion to celebrate or if you need an excuse to spoil yourself – High Tea at the Table Bay Hotel is the place to do it. High Tea is served daily from 2pm until 5:30pm, to book please call: 021 406 5988. If you’re looking for more information, have a look at their website.